SAMe is a molecule produced constantly by all living cells. It is a good nutrition for the liver,can prevent alcohol, drugs and the liver-cell injury; has remarkable preventive effects on chronic active hepatitis, and other factors caused liver injury,heart disease, cancer and so on.. SAMe has been found to be as effective as pharmaceutical treatments for arthritis and major depression as well. 1. S-Adenosyl-L-methionine (SAM, SAMe, SAM-e) is a coenzyme involved in methyl group transfers. 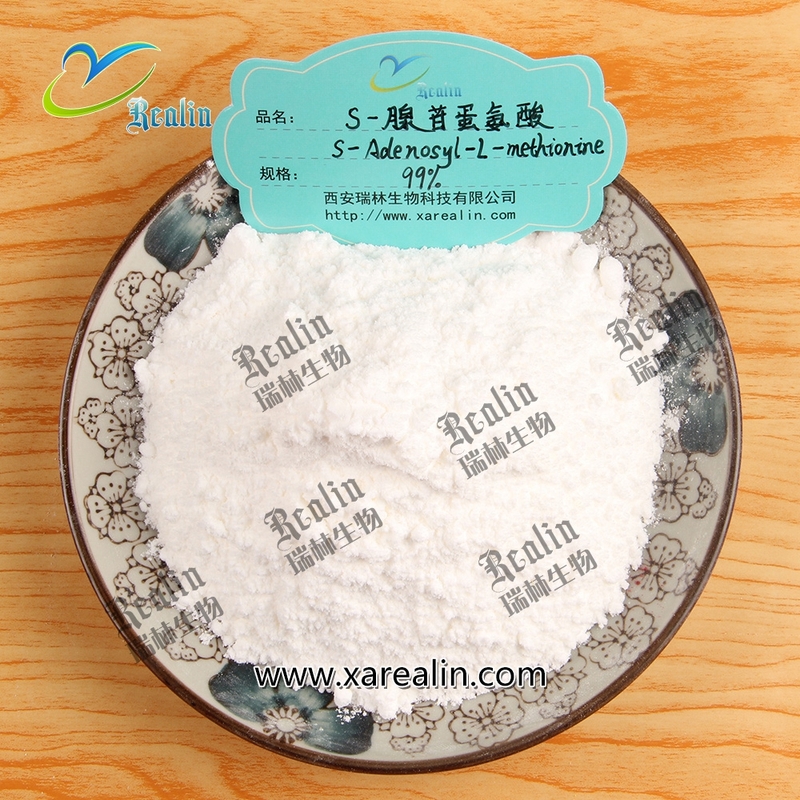 It is made from adenosine triphosphate (ATP) and methionine by methionine adenosyltransferase (EC 2.5.1.6). Transmethylation, transsulfuration, and aminopropylation are the metabolic pathways that use SAM. Although these anabolic reactions occur throughout the body, most SAM is produced and consumed in the liver. 2. The methyl group (CH3) attached to the methionine sulfur atom in SAM is chemically reactive. This allows donation of this group to an acceptor substrate in transmethylation reactions. More than 40 metabolic reactions involve the transfer of a methyl group from SAM to various substrates such as nucleic acids, proteins, and lipids. 3. In bacteria, SAM is bound by the SAM riboswitch, which regulates genes involved in methionine or cysteine biosynthesis. The reactions that produce, consume, and regenerate SAM are called the SAM cycle. In the first step of this cycle, the SAM-dependent methylases (EC 2.1.1) that use SAM as a substrate produce S-adenosyl homocysteine as a product.This is hydrolysed to homocysteine and adenosine by S-adenosylhomocysteine hydrolase EC 3.3.1.1 and the homocysteine recycled back to methionine through transfer of a methyl group from 5-methyltetrahydrofolate, by one of the two classes of methionine synthases (EC 2.1.1.13 or EC 2.1.1.14). This methionine can then be converted back to SAM, completing the cycle. 4. Another major role of SAM is in polyamine biosynthesis. Here, SAM is decarboxylated by adenosylmethionine decarboxylase (EC 4.1.1.50) to form S-adenosyl-5'-3-methylpropylamine. This compound then donates its n-propylamine group in the biosynthesis of polyamines such as spermidine and spermine from putrescine. 5. SAM is required for cellular growth and repair. It is also involved in the biosynthesis of several hormones and neurotransmitters that affect mood, such as dopamine and serotonin. Methyltransferases are also responsible for the addition of methyl groups to the 2' hydroxyls of the first and second nucleotides next to the 5' cap in messenger RNA. 6. In the United States, SAM is sold as a nutritional supplement under the marketing name SAM-e (also spelled SAME or SAMe). Some research has indicated that taking SAM on a regular basis help fight depression, liver disease, and the pain of osteoarthritis. Multiple clinical trials indicate benefits for depression, some liver conditions and osteoarthritis. All other indications are not yet proven. 2.SAMe has remarkable preventive effects on chronic active hepatitis, and other factors caused liver injury,heart disease, cancer and so on. 3.SAMe has been found to be as effective as pharmaceutical treatments for arthritis and major depression as well. S-Adenosyl-L-methionine (SAM, SAMe, SAM-e) is a coenzyme involved in methyl group transfers. It is made from adenosine triphosphate (ATP) and methionine by methionine adenosyltransferase (EC 2.5.1.6). Transmethylation, transsulfuration, and aminopropylation are the metabolic pathways that use SAM. Although these anabolic reactions occur throughout the body, most SAM is produced and consumed in the liver.